Theory turns toxic when institutionalized. Just look at modern economics. Economists surround themselves with models that are supposed to predict everything from inflation growth to GDP. These models wind up failing because they try and take a perfect, fitted theory and apply it to a messy and often times random world. Think about the basis of all economics. It assumes that each player is “rational”. Just the other night our team met up with one our friends on her way to earning a PhD in the field. Her most recent project involved inflation forecasting. She’s spent hundreds and hundred of hours on this research. Her conclusion? Well she wouldn’t admit it until we got a few beers in her, but she found that the best inflation forecasters in the world (our friends at the Fed) were no better than random. Only rarely did they predict a result slightly more accurate than random. Any economist outside of the Fed actually did worse than random. So much for experts being better than dart throwing monkeys right? Here’s the thing, if our friend realized this in her schooling, you can bet the economic PhDs sitting in their ivory towers know this fact too. But it doesn’t exactly benefit them to admit to it. Not after an entire economic institution has been built around the “success” of forecasting. You can’t come out and say it’s mostly BS. You would be out of a job. And so the farce continues. Now if these forecasting methods continue to persist, you can bet the theories backing them are heavily guarded also. This is where economic theory turns “toxic”. This is taught to every single Econ 101 student around the world. It’s the basis for most economic theory. But unfortunately, it’s grossly inadequate (for reasons we’ll discuss soon). Do our PhDs know this? Maybe. Either way, they sure as hell aren’t going to change it now. Why try and pull the Jenga block that’ll make the entire institutional tower come down? It’s in there self-interest to just keep on, keepin on. But that doesn’t mean you have to stick to this sorely lacking economic model. We don’t. Instead, we prefer to use legendary hedge fund manager Ray Dalio’s Transactions Approach. The first thing you need to understand is that the economy is really just made up of a bunch of transactions. A transaction is simply the exchange of money (or credit) for a good, service, or financial asset. Now combine all the transactions for a particular good and you get a market. For example, there’s one market for oil and another market for cotton. An economy is created when you combine all these different markets and their transactions. To understand any economy or market, all you need to know is the total amount of money (or credit) spent and the total quantity of goods sold. 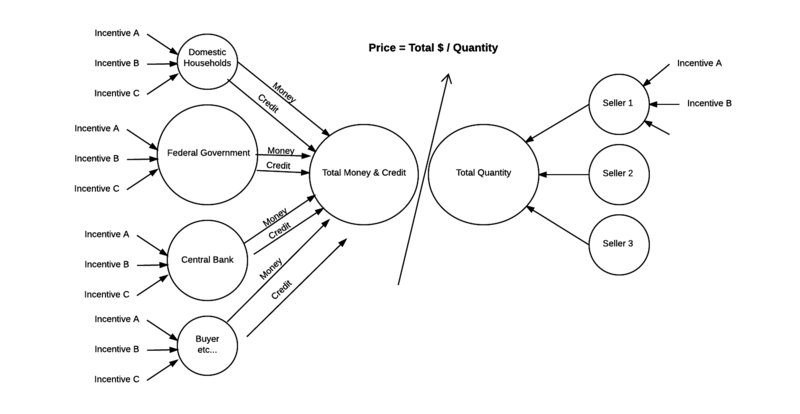 Divide the total spending by the total quantity of goods sold and you get the market price. In markets there are number of different buyers and sellers, all with different motivations. It’s impossible to identify them all, but isolating the biggest buyers (largest drivers of demand) is easy. The reason these buyers (and not sellers) can be evaluated is because much of their demand is based on how much credit and money is available in the economic system. More credit and money leads to more demand, while less credit and money leads to less demand. The concept of money vs credit goes much deeper, but we’ll save that topic for another discussion. For now, it’s important to understand that the transactions approach does take the difference between these two into account. The approach reveals that changes in total buying have a much larger impact on prices than changes in total selling. This is due to the fact that the supply of money and credit is far easier to adjust than the supply of goods. Buyers in an economy can be split into two categories. They can either come from the private sector or the government sector. The private sector is made up of households or businesses, both domestic and foreign. The government sector is made up of both the Federal Government and the Central Bank. The Federal Government produces demand through public spending and the Central Bank produces demand by creating money and spending it on financial assets. Establish market prices by dividing total spending by total quantity of goods sold. Identify the biggest buyers in the market. The standard model doesn’t look at the economy through the lens of transactions. 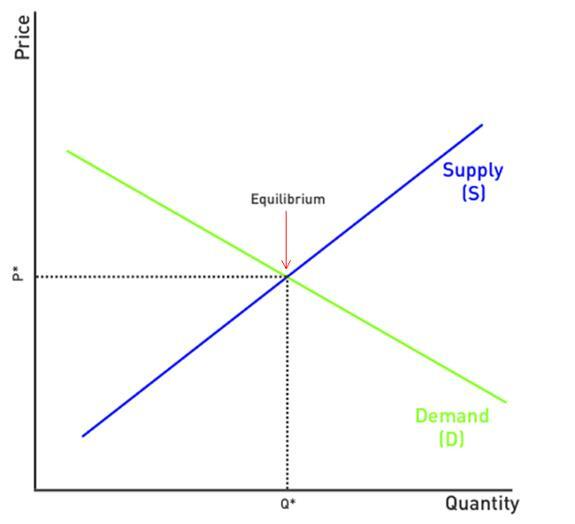 Instead, it measures supply and demand through a single quantity. This model completely fails to identify the amount of spending, which buyers the spending comes from, and their motives. It groups all buyers into one and focuses on quantity bought instead of how much was spent. It also doesn’t distinguish between money and credit. But again, this theory is baked into every level of economics. It’s not going to be changed by the institutions promoting it. Now one of the most interesting aspects of the transactions approach is the disaggregation of buyers in the economy. This can be done on both the macro and micro scale. The approach is useful for both. Dumb Funds: These are large retirement and mutual funds such as Fidelity, Vanguard, American Funds, etc. The managers of these funds aren’t necessarily dumb, but they’re trapped in a system that forces them to always be long and fully invested. These restrictions have the effect of turning them into dumb money. It’s important to watch these guys because they make up a large part of the big money flows in the markets. Technical Players: This group ecompasses everyone from classical chartists, to trend followers, to breakout (IBD / William O’Neil) style traders. These players don’t necessarily cause turning points, but instead serve to amplify a trend that’s already started. You’ll see them jump into an asset after a major technical break. Their actions are easy to see by just looking at a chart. Smart Hedge Money: This group combines many types of analysis including fundamental, technical, quant, sentiment, etc. These are guys like Stanley Druckenmiller that pay attention to things like macro liquidity, business cycles, and the actions of the Fed. Many of them don’t speak in public too often, so a good way to see their holdings is through 13F filings. Smart Value: This is the pure fundamental group you can piggyback off of to find the best deals in the market. They’re focused on value with a margin of a safety. You can follow value investors like Seth Klarman right through their 13F filings. This is just one example of buyer profiles you can create in the market. Being able to identify buyers and establish their motivations is very useful to determine liquidity and capital flows. These flows are what drive prices. So the next time you want to understand why an asset’s price is moving, just use the transactions approach and everything will become a lot more clear.